Today, the Third Industrial Revolution is upon us, cutting across sectors to weave robots and adaptive algorithms into the fabric of our lives. Advancements in sensors, mechanical systems, wireless communication, computing, cameras, and other technologies have enabled advanced robotics and automation systems. 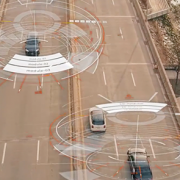 Autonomous vehicles may be just around the corner. Robots can vacuum floors, write the news, and even fight fires. Robots that can walk, talk, and safely work alongside humans may soon help the economy grow at surprisingly high growth rates. 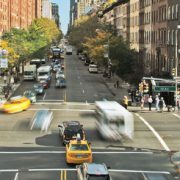 According to an Oxford University study published earlier this year, roughly 47% of all jobs in the U.S. labor force today will be automated during the next 10 to 20 years.1 While that trend sounds ominous for the U.S. workforce, a deeper dive into the study suggests automation will spur productivity and add enormously to GDP per worker as higher value-add jobs displace lower skilled positions. Education and retraining will be important bridges for students and workers if they are to adapt successfully to the changes in automation during the next twenty years. 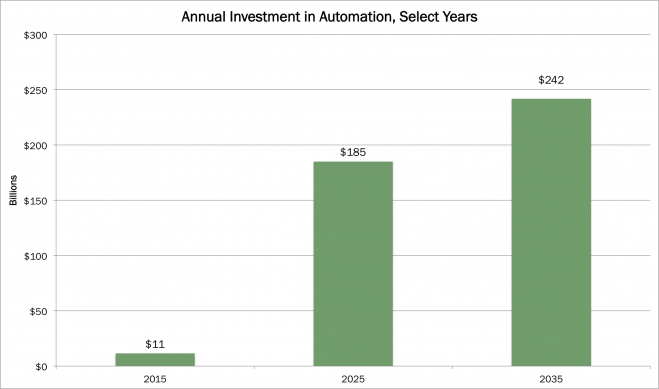 The investment required to bring automation to life will be orders of magnitude higher than historically has been the case, roughly $4 trillion cumulatively through 2035. 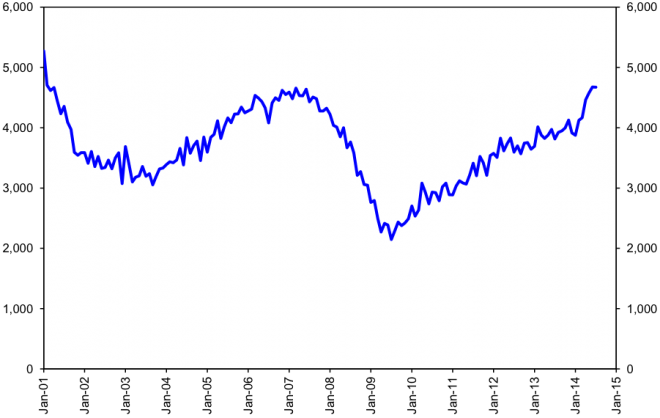 If the Oxford study is correct in assessing the probability of automation in each of the 702 job classifications it analyzed, the impact on real domestic output of goods and services (GDP) will be transformative. As shown below, thanks to the incremental productivity from automation, real GDP per U.S. worker will more than double from $113,000 this past year to $236,000, compounding at an annualized growth rate of 3.4% through 2035, and at an accelerated rate of almost 5% from 2025 to 2035 as shown above. 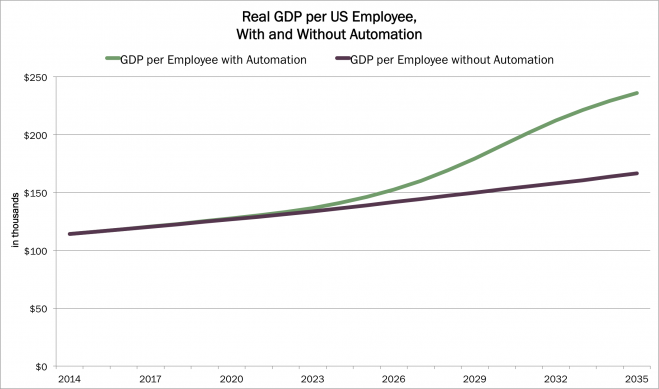 In the absence of automation, productivity would increase at roughly half that rate, or 1.8%, and real GDP per worker would reach only $167,000. 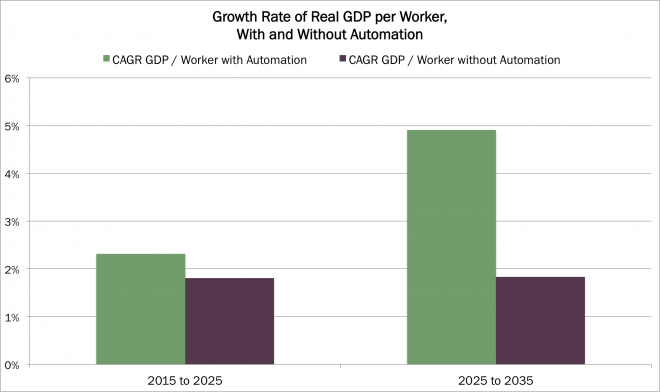 In other words, in twenty years, real GDP per worker will be 42% higher and real GDP $12 trillion higher with automation than without it, and will approach $40 trillion. 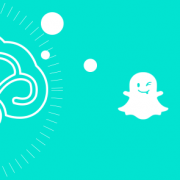 The social impact could be profound. As shown below, automation will replace one million jobs by 2020, and over 75 million positions by 2035- roughly half of the jobs currently in the United States. While automation sounds like an ominous prospect for labor, the “bigger pie” seems to fly in the face of that argument. 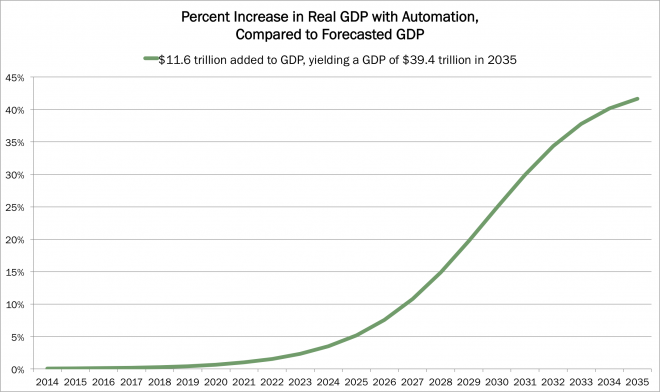 Where will the $12 trillion in incremental real GDP associated with automation surface by 2035? A good question… with several answers. Some of it could drop to the bottom line of corporate America in the form of higher profits. The food services industry could be one of the biggest beneficiaries given its labor intensity and low margin structure. 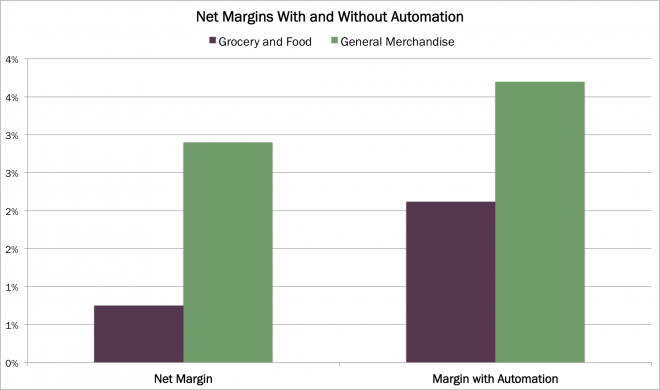 As shown below, grocery store margins could nearly triple from less than 1% to almost 3%, while general merchandise margins could increase by more than 25% from nearly 3% to 3.75%. 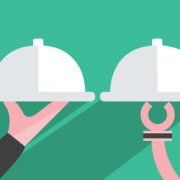 In both industries, shrinkage provides a large part of the explanation. For competitive reasons, companies may choose to reinvest some of the windfall from automation, accelerating capital spending growth. 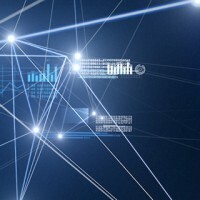 As artificial intelligence begins to solve increasingly complex problems, the return on investment from “smarter” robots, drones, autonomous vehicles, and other devices will drive their adoption. Therefore, between 2015 and 2025, as is illustrated below, annual investment in all forms of automation could escalate from $11 billion to $185 billion, or at a compound annual growth rate of 32%, and from 2015 to 2035 at a compound annual rate of 17%. 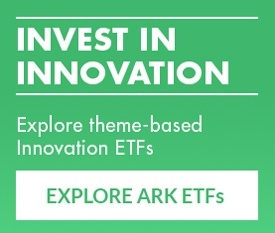 Unit growth rates could be higher, given the declining cost curves in technology. This rate of growth would be exceptional, providing a glimpse into the upside to the economy associated with automation. Competitive dynamics could turn the gains from automation into benefits for the consumer, in the form of higher wages and/or lower prices. Already today, as illustrated below, a record 4.8 million jobs in the U.S. go unfilled because of skill-set mismatches. Clearly, companies will have to invest in training to attain more technologically sophisticated and skilled labor. 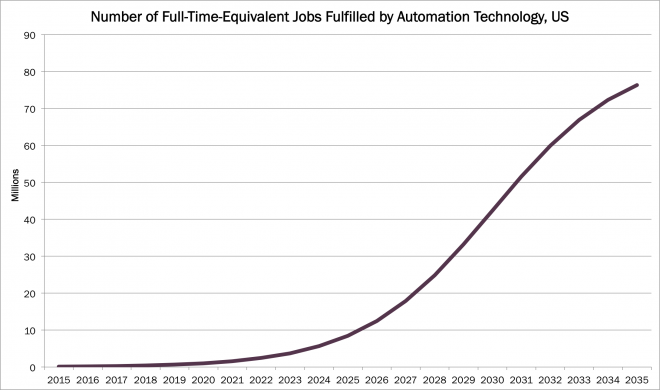 Ironically, the automation industry is projected to add another 4.8 million jobs by 2035. Corporate-sponsored training and retraining programs should deliver high returns on investment, as should vocational school programs. As technology continues to permeate the cost structures of most industries, well run companies should enjoy flat to declining cost curves, giving them more ammunition to compete on price – another boost to consumer purchasing power. 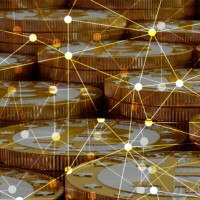 As has been the case historically, automation may cause short-term dislocations but ultimately it will increase the value of labor per dollar of output, create a virtuous cycle, and increase living standards meaningfully in the U.S.
As for the other 70 million positions to be created, only the imagination limits the possibilities. As they lost their farms in the mid to late 1800s, farmers never could have imagined how the automobile, telephone, computer, or cell phone could create so many jobs, increase the quality of most peoples’ lives, spawn completely new industries, and create astonishing wealth.